Boy there’s a lot of action tonight! That’s the way we like it Urban American Style. I just got through landing a 21lb catfish and Candy’s rod is bending down hard; we know it’s a big fish because it’s pulling drag. The guide hands her the rod and the fight is on. Work it girl cause we’re gonna eat good tonight! Some of the best fishing that I have done this year was winter catfishing. Typically cat fishing is done in the spring and summer, but you can do some serious fishing in the winter, too. There are all kinds of places in Kansas and Missouri to fish. Over the past month I spent a little time at Truman Lake near Warsaw, Missouri. Winter catfishing is the time of the year you can catch some of the bigger blues and flathead catfish, and on this excursion we were after some of those big Blues. Blues are very aggressive and feed in running waters. For those who are looking for that trophy fish, winter is a good time to be out. The look of Blue Cat reminds me of some of the Sandbar Sharks we caught in the Gulf, that’s why I personally call them Fresh Water Sharks. The first thing we did earlier this evening was to go out and net some large Shad, which we had planned to use for our bait later. A lot of people use Shad, others like skipjack or liver for their bait. Our plans were to be out this evening to do a little night fishing, because we were told they had been hitting hard every night. We were fishing south of the dam, where they were releasing running water. We were out with our guide on the boat checking our sonar and GPS to figure out the sweet spot to get our fish. Our guide was pretty excited because we could see big schools of Shad and a lot of big cats below. We finally found our spot and anchored our boat into the current. We then set up six rods and reels and after the first thirty minutes we had a couple of bites. It didn’t take much longer after that for all havoc to break loose. We must have gotten three bites at the same time, it was definitely fish on! I hooked onto my first fish of seven blues; once I landed this fish, I could feel it was going to be a good night. The action was steady and consisted for the first hour. After landing a few fish I took the camera o our camera guy, Lamont could do his thing. The first fish Lamont hooked was a decent blue, but the real excitement came later. 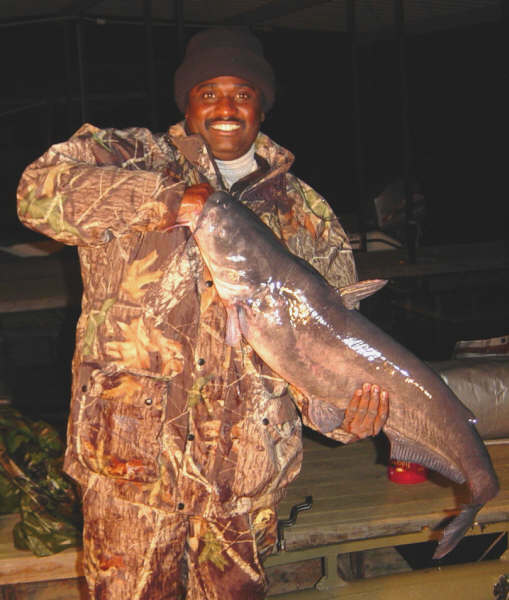 Lamont was the only person on the boat to catch a 29 ½ lb Flathead Catfish, and he was elated. The entire evening was like that – exciting and fruitful. Last but not least, there was Candice our Executive Producer. Not be left out, later on that evening, Candy’s rod bent down hard – we knew it was a big one – she had to fight her fish for fifteen minutes. Candice finally got her fish up to the side of the boat and our guide netted him; once we got him landed, that fish weighted in at 30lbs. This was her very first Blue Catfish – she was ecstatic. Five hours and fourteen fish that totaled over three hundred pounds later, we called it a wrap. We had enough film in the can, a lot of fun and a whole lot of fish for our friends and family. So for all you fisher men and women, just because it’s wintertime don’t let it stop you from getting your fish on. We’ll see you again soon in the great Urban American Outdoors!